I’ve always been mechanically inclined. I come from a long line of blacksmiths and machinists. I’ve always been good at tools so I wanted to do something with my hands. It helped me decide to go here because I got a scholarship and because I had a ship to work on during the year and there are a lot of job opportunities. I like the idea of engineering at SUNY Maritime better than at another college, because it physically trains you for the job rather than just telling you about it. Definitely the people and the hands-on nature of the college are my favorite things. I have the best friends here. It takes really good people to do these programs. Having our own ship is the best part. It gives you a better opportunity for a real education, rather than hypotheticals. 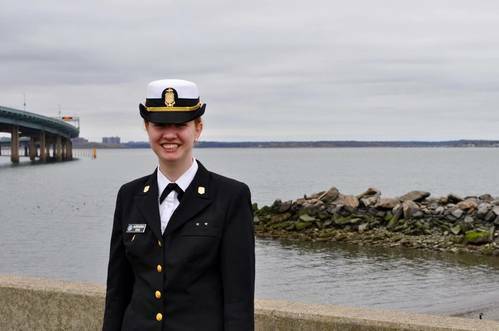 I’m studying marine engineering, which I love because it focuses on ship systems engineering – how the whole plant works together. I want to sail out, at least until I get my first engineer license. After that, I think I want to be a port engineer. I’m a really eager, hard worker. I’ve never stepped away from a challenge. This whole school is a challenge, so you can’t. When I come out of here, I won’t know everything but I’m excited to go out and continue learning on the ships. For an engineer to say I love working with people is weird, but it’s true. Before I came here, I’d heard about the cadet-shipping program. I knew it was something I needed to do because it would give me experience in the real world. I did it last summer, where I shipped out with TE Subcom, a cable-laying company. It was the best experience I could have had. We spent a month in Portland, Oregon, which gave me time to take apart everything in the engine room with the second engineer. They were really good at showing me and helping me to develop my skills and knowledge. Then we spent a month at sea, checking cables down the California coast.